Here's a family mystery.... 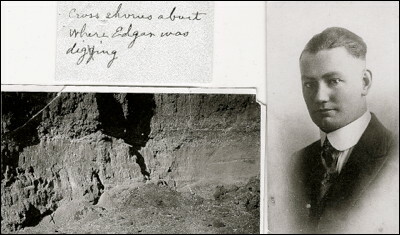 This is my grandfather Roscoe's brother, Edgar Doty (1893-1921), and a photo with these words written on the back: "Cross shows about where Edgar was digging." No date, no location, and no hint as to what he was digging up (or burying). Hmmm.... Treasure? Gold? Something slightly sinister? X (lower left) marks the spot!